Back in the 90's, I organized an annual bodyboard contest called the Summer Slam. My friends and I ran that for 13 years! I couldn't believe it either! This summer while shooting down in my hometown of IB, Katy (Katy's Cafe head honcho) mentioned that she wanted to put something together for the local groms. I immediately said, let's do it. This was right before I took off on my summer trips. So when I returned, Katy and I got the ball rolling. 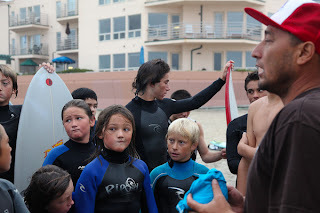 -It's for groms only (16 and under). -BBQ after the event at Katy's Cafe. -Every finalist walks away with prizes and cool trophy. -Did I say FREE to enter? Oh yeah, I did. "What did he just say about 10 wave maximum?"